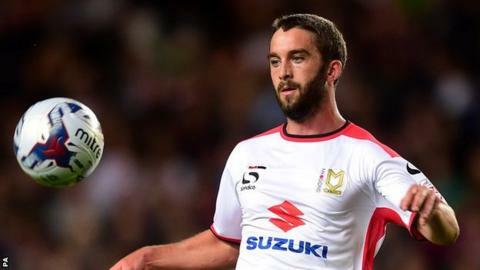 Will Grigg scored twice as MK Dons moved above promotion rivals Swindon and to within five points of second place in League One with a clinical victory in an enthralling game. A thrilling first half full of chances failed to produce a goal. But Daniel Powell's instinctive header opened the scoring after the break and Grigg made it 2-0 with a lovely curled shot after another slick passing move. Grigg added his second through a close-range strike with two minutes left. The victory takes Dons up to third, two points and one place above a Robins side who matched their visitors for much of the game, but lacked their quality in front of goal. Home goalkeeper Wes Foderingham had to make three fine saves to twice deny Grigg and keep out a low Powell strike, and Dons also had two penalty claims turned down. At the other end, Michael Smith had two decent sights of goal but was off target while Dean Lewington did well to block a Jonathan Swift strike. Dons started to take control after the interval as the game became slightly less frenetic. And after Powell headed in on the follow-up after a smart Foderingham save, Grigg's composed shot, following great work by Dele Alli and the excellent Samir Carruthers, made it 2-0. Swindon rallied and Ben Gladwin had a fierce low shot brilliantly saved by David Martin, but Grigg tapped home a third to seal victory late on. "I didn't think we deserved to lose 3-0. First half it was a pretty good game and it could have gone either way. "I felt whoever got the first goal would possibly run out the winners. "The longer the game went we had to try and gamble a little bit and get something back and left ourselves a bit more open at the back. But we weren't at it today, especially in the second half." "We had a game plan. We almost reluctantly gave up possession of the ball, which is different to how we normally play when we like to build up from the back. "Tactically, we had a different way of playing and the players took that on board really well and I think we deserved the win. I thought every single player on the pitch deserved to wear that shirt of ours. To beat Swindon home and away is, for me, as good as it gets." Match ends, Swindon Town 0, MK Dons 3. Second Half ends, Swindon Town 0, MK Dons 3. Substitution, MK Dons. Devante Cole replaces William Grigg. Corner, MK Dons. Conceded by Raphael Rossi Branco. Goal! Swindon Town 0, MK Dons 3. William Grigg (MK Dons) right footed shot from very close range to the centre of the goal. Assisted by Lee Hodson with a cross. Substitution, MK Dons. Jordan Spence replaces Samir Carruthers. Attempt missed. Michael Smith (Swindon Town) right footed shot from outside the box misses to the left. Substitution, Swindon Town. Jonathan Obika replaces Ben Gladwin. Corner, Swindon Town. Conceded by David Martin. Attempt saved. Ben Gladwin (Swindon Town) right footed shot from the left side of the box is saved in the top left corner. Attempt missed. Lewis Baker (MK Dons) right footed shot from outside the box is close, but misses to the right. Substitution, MK Dons. Lewis Baker replaces Dean Bowditch. Goal! Swindon Town 0, MK Dons 2. William Grigg (MK Dons) left footed shot from very close range to the bottom right corner. Assisted by Samir Carruthers. Attempt missed. Andy Williams (Swindon Town) right footed shot from the right side of the box misses to the right. Attempt saved. Andy Williams (Swindon Town) right footed shot from outside the box is saved in the top right corner. Corner, Swindon Town. Conceded by Lee Hodson. Substitution, Swindon Town. Yaser Kasim replaces Sam Ricketts. Substitution, Swindon Town. Andy Williams replaces John Swift. Goal! Swindon Town 0, MK Dons 1. Daniel Powell (MK Dons) header from the centre of the box to the high centre of the goal. Delay in match Wes Foderingham (Swindon Town) because of an injury. Wes Foderingham (Swindon Town) wins a free kick in the attacking half. Corner, MK Dons. Conceded by Wes Foderingham. Attempt saved. Samir Carruthers (MK Dons) right footed shot from outside the box is saved in the top left corner.